This is a limited edition smartphone. This phone was spotted last week. The month the company has launched Unite 4 Plus also. We have given the news about that also. Here are the specs of this upcoming smartphone. Here we go. Canvas5 Lite has a 5-inch IPS display with 16M colors and Corning Gorilla Glass protection. The resolution of the screen is 720 x 1280 pixels and has a good pixel density. Canvas 5 Lite is powered by a 1.5 GHz quad-core MediaTek processor (MT6735P). The company is offering a RAM of 3 GB and an internal memory of 16 GB on the device. The internal memory of the smartphone can be expandable up to 32 GB using a microSD card. The device has a slot for the memory card(microSD card). The operating system of the Canvas 5 Lite is Android Lollipop v5.1. The company is providing a primary camera of 8-megapixels with LED flash and on the front, there is a 5-megapixels camera for selfies and video recording. The camera features autofocus, face detection, Geo-tagging and other common features in it. The device is powered by a 2,000 mAh battery. The company is promising to deliver 150 hours of standby time and 4.5 hours of talk time. 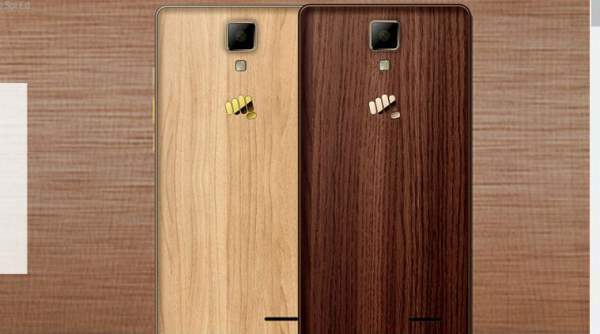 The only thing which makes the device special is that it has got a wooden back panel. This wooden back panel makes the device look classy and furnished. Other common connectivity options are also included in the specification list of the gadget. The options are 4G, LTE, 3G, Wi-Fi, Bluetooth, a microUSB port and GPS. There is an audio jack of 3.5 mm in the device. Canvas5 Lite is priced at Rs. 8,999. It is available on an e-commerce website onlymobiles.com. It was expected that like the previous Micromax smartphones, this would also be available on the famous e-commerce website flipkart.com. This model has already been listed on the company’s official website. But, no price details have been shown on the site. It is expected that the price of the device is Rs. 8,999. Nor there is any availability of the device on the company’s website. Hope you like the content on our website and for more information, Kindly Stay Tuned and subscribe to our website.